This page evaluates biomedical research as a career option. It provides information that can help you answer a question of the form Should I pursue a career in biomedical research? We posted an early version of this post to Less Wrong, and the comments there may be of interest. Our section on job security in academia as a career option gives some general considerations. 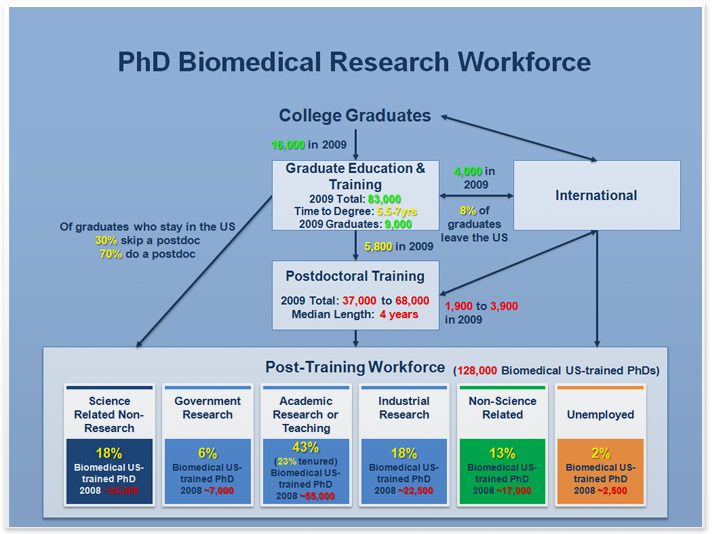 This graphic says that after finishing graduate school / postdoc, of biomedical research PhDs, 18% go into non-research science jobs, 6% go into government research, 43% go into academia or teaching, 18% go into industrial research, 13% do work outside of science and 2% are unemployed. Roughly 50% of those who complete a postdoc and go into academia get tenure, and the career outcomes for those who don't get tenure are unreported. An important question is that of how correlated research ability is with job security. If luck plays a sufficiently large role then high ability doesn't guarantee a job, whereas if skill can overcome luck, then those who are skilled can be confident that they'll be able to get jobs. An interview with Prof. Andrew McMichael at the 80K blog seems to suggest that sufficiently high quality researchers can get jobs and funding. However, going into graduate school, one's ability level may not be clear. It's unclear how job security is changing over time. In 2010, the Bureau of Labor Statistics reported that the number of jobs was expected to grow 36% over 10 years (much faster than average). But in 2012, the Bureau of Labor Statistics reported that the number of jobs is expected to grow 13% over 10 years, and in the intervening time the number of jobs had grown only 3%. So there appears to have been a substantial change in outlook in only two years. The job growth rate forecasts have to be viewed in juxtaposition with the expected change in number of new PhDs. According to one source, the National Institutes of Health found that the number of new PhDs increased by 50% between 2002 and 2009. If this rate were to be sustained, the ratio of jobs to job candidates would decrease even more. Biomedical researchers who stay in academia are often constrained with respect to the geographic location where they can get jobs. See our section on job location options for academics in academia as a career option. Getting a PhD in a biomedical research field takes 6 to 7 years, during which one makes substantially less money than one could otherwise make. It's been reported that the average biology PhD had $45k in debt as of 2004. Colleges, Universities, and Professional Schools are next in employment, and pay a mean wage of $61,320 per year. Completing the five areas with the most employment are Pharmaceutical and Medicine Manufacturing ($92,130), General Medical and Surgical Hospitals ($80,090) and Drugs and Druggists' Sundries Merchant Wholesalers ($93,090). The "Colleges, Universities, and Professional Schools" category includes postdocs: if one considers professors only, the figure will be more like $80k/year. Society desperately needs your talents [...] For rationally thinking people with an altruistic bent, life can be no more rewarding than when practising the scientific method for the benefit of all of the denizens of this fragile planet. Low replication rates — The fact that a large fraction of studies don't replicate suggesting that much research doesn't move science forward. This page was last modified on 5 April 2014, at 23:15.